2. The Two H’s—Hillary and Healthcare Continued…How Much is Priced into Sector? 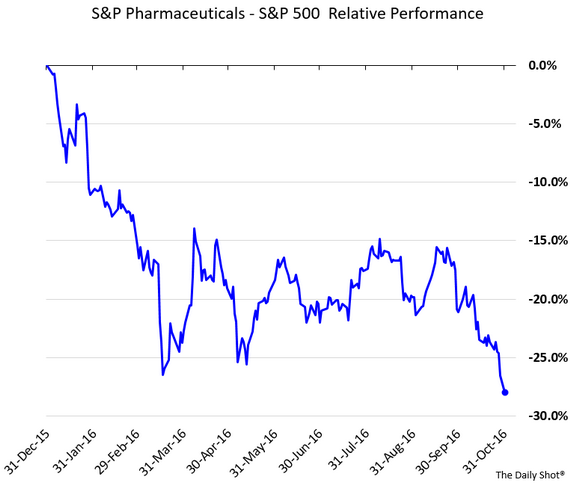 Pharma 30% Underperformance YTD with Massive Baby Boomer Wave Entering Senior Years. The sector has underperformed the S&P500 by almost 30% year-to-date. I thought this was a fascinating chart. 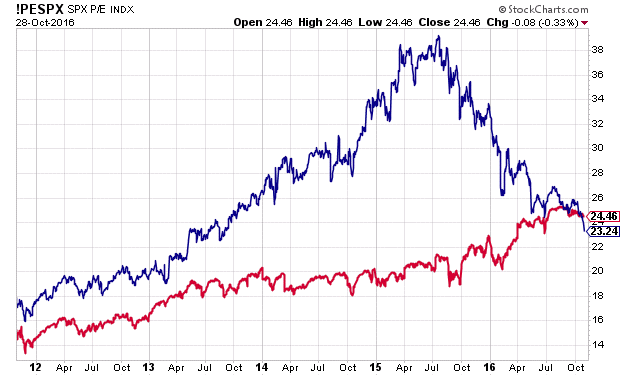 It shows the P/E Ratio of Healthcare stocks (blue) compared with the P/E Ratio of the S&P 500 (red). 3. The Next President and Defense…Defense Contractors Hitting 52 Week Highs. 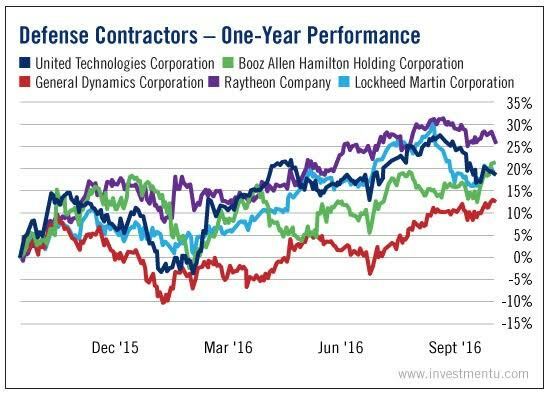 In recent weeks, the stocks of many defense contractors have climbed higher. A bunch of them are at or near 52-week highs. It seems like the Pentagon is concerned about its new boss. And it wants to buy as much arsenal as possible before it meets him or her. 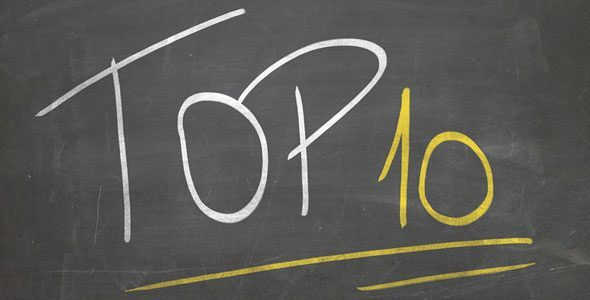 Raytheon (NYSE: RTN) and Booz Allen Hamilton (NYSE: BAH) are up more than 20% this past year. Lockheed Martin (NYSE: LMT) and United Technologies (NYSE: UTX) both hit annual highs in the last couple months. In the case of Lockheed, we can see what caused the recent rally. But it brings up more questions than it answers. Shares have been climbing all summer, after Lockheed smashed second quarter earnings estimates. It surprised analysts by a whopping 13.7%. United Technologies has seen similar performance, beating Q2 estimates by 10.3%. It’s abundantly clear that defense spending is on the rise in recent months. Why? We don’t quite know. That sort of information is usually classified. 4. 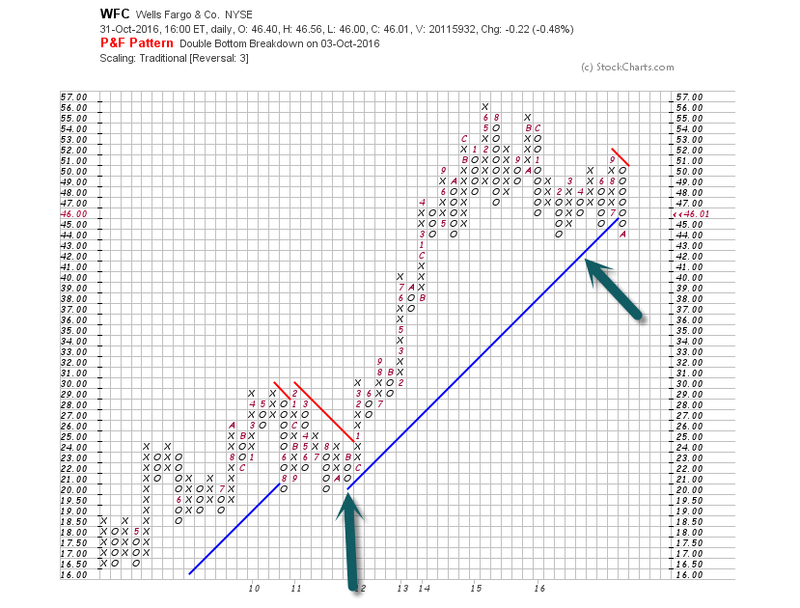 Two Interesting Bank Charts…WFC and BAC. 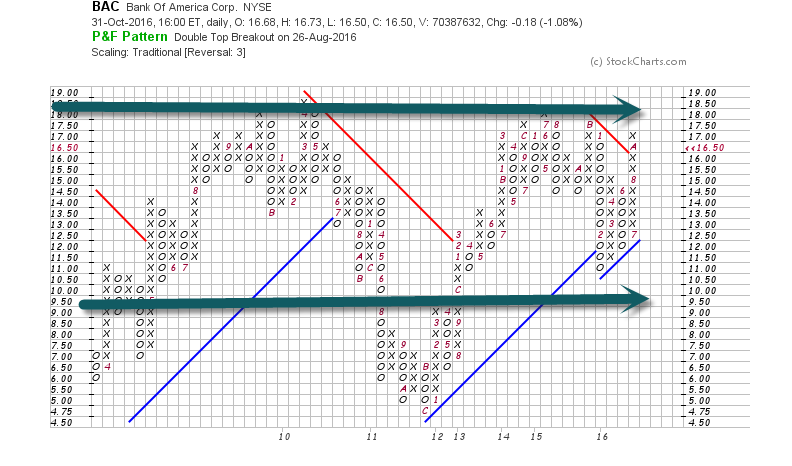 BAC-Bank of America—In a Box Since 2009. 5. 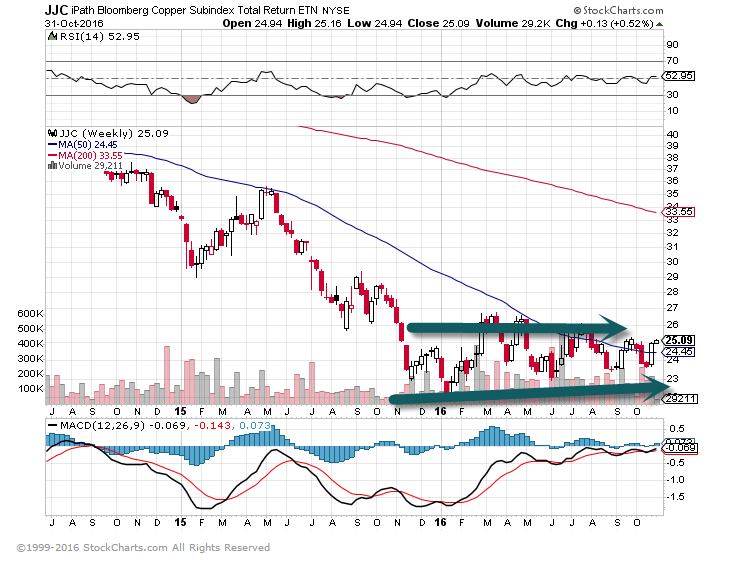 With Metals Getting a Bounce in 2016, Copper Still Going Nowhere. There was a thought process that copper was an economic predictor. 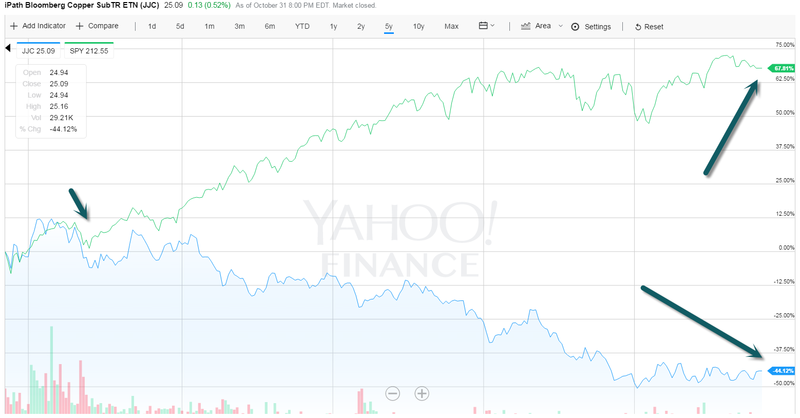 5 Year Chart…S&P +67% vs. Copper -44%. 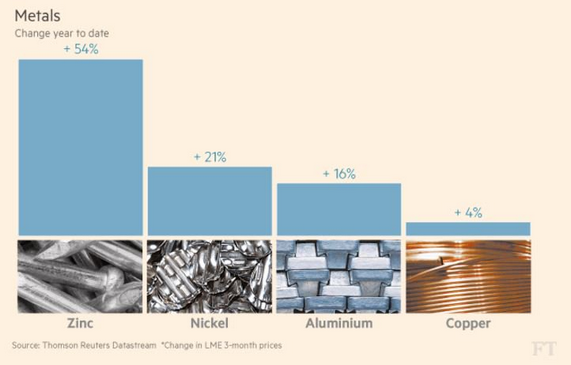 Here is a summary of some of the most actively traded metals’ performance year-to-date. The second chart below shows the London Metal Exchange index. Stocks went nowhere today. 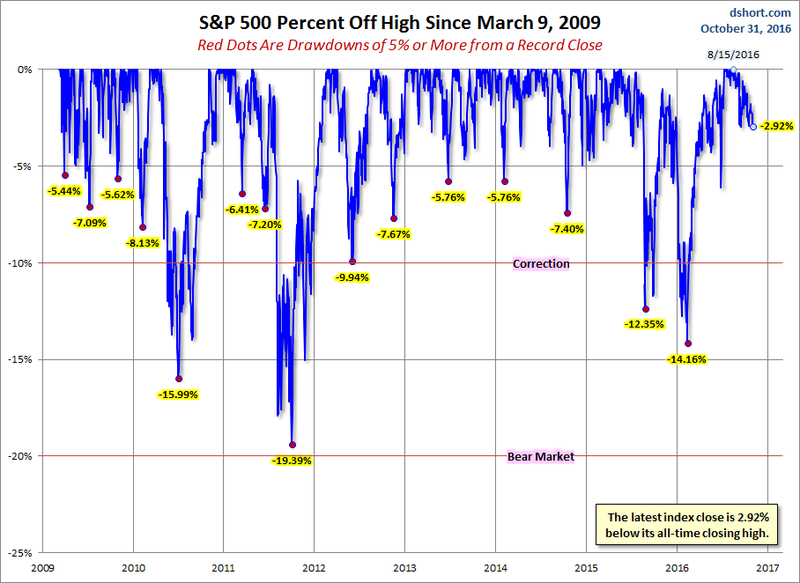 All three of the widely tracked US indexes finished in the shallow red. Our preferred benchmark S&P 500 opened higher bounced off Friday’s closing price to its modest 0.32% intraday high in the late morning. It then sold off steadily to that same Friday close trampoline, made a tiny bounce and then closed flat with its fifth consecutive loss, albeit a miniscule -0.01%. The is the first five-day selloff since mid-June. The 10-year closed the session at 1.84%, down two BPs from the previous close. Here is a snapshot of past five sessions in the S&P 500. Interestingly enough the trend line is a residual from the 5-day chart we posted on Friday…exactly the same slope from the five-day high to the latest close. 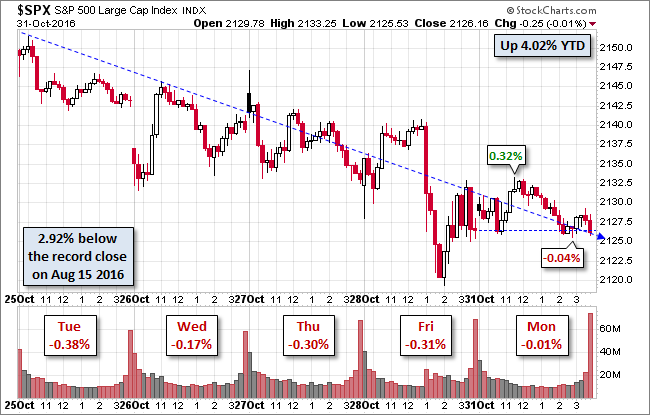 Here’s a daily chart of the index. 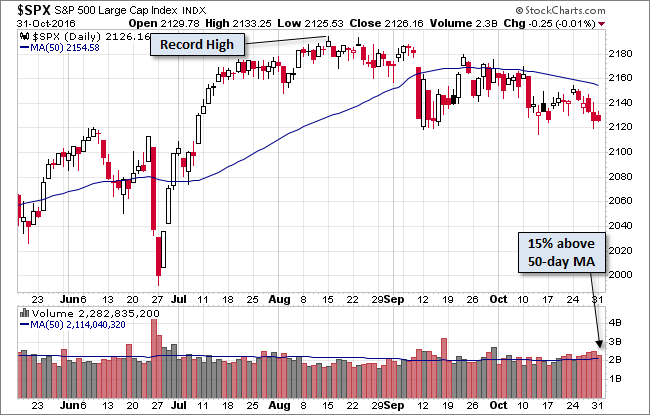 Trading volume on the last day of the month was unremarkable. 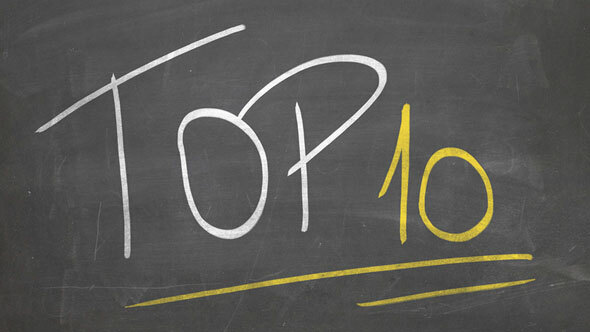 A Perspective on Drawdowns…A Recurring Top 10 Chart. Here’s a snapshot of selloffs since the 2009 trough. 7. 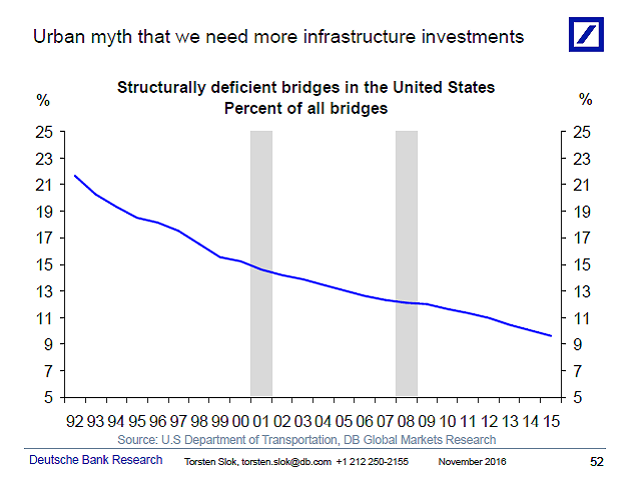 The Infrastructure Myth?? 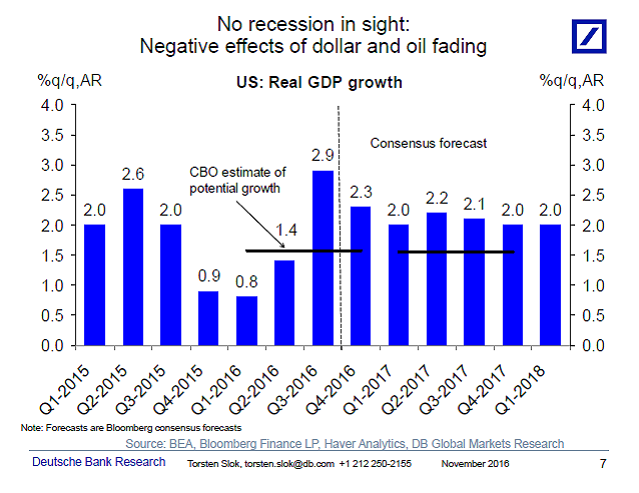 Interesting Chart from Torsten Slok. 8. 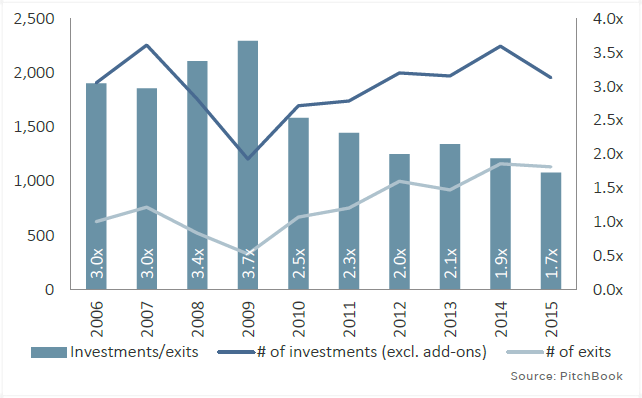 Private Equity is Loaded up on Capital….How do they Deploy? 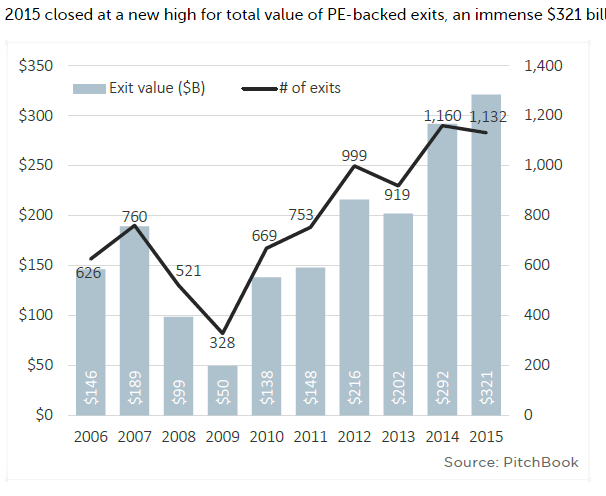 2015 Private Equity Exits Hit a Record. 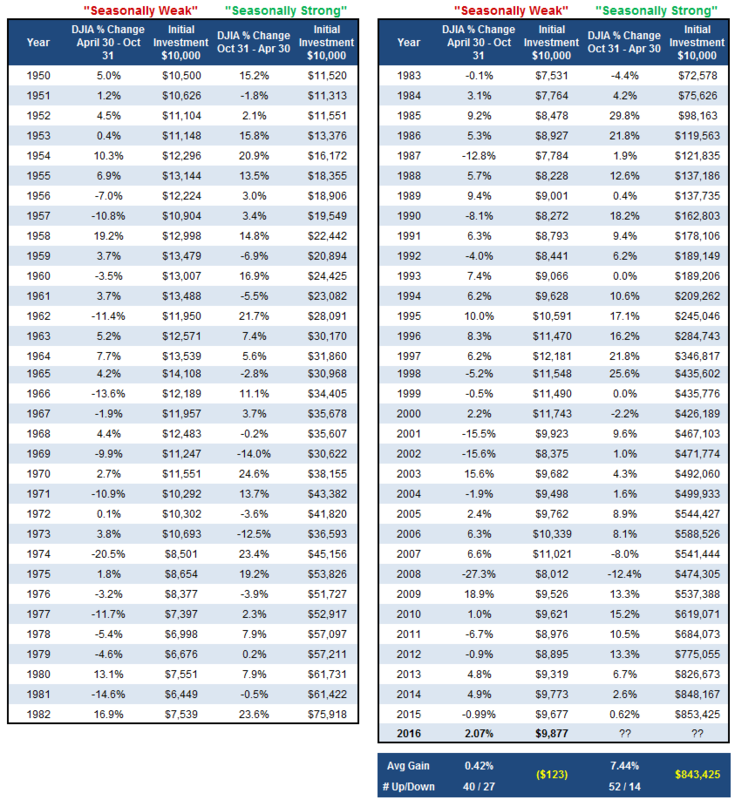 U.S. PE investment-to-exit ratio by year. Highest-ever aggregate payout to investors is accompanied by a new high in unused capital. Dry powder hit another all-time high despite private equity funds returning a record $443 billion to investors in 2015, according to Preqin. Cash allocated by investors but yet to be deployed rose sharply in the first nine months of the year, Preqin said, from $757 billion at the end of 2015 to $839 billion at the end of September 2016. “The consequences of this ‘wall of capital,’ coupled with high asset pricing, are being seen in the difficulty many managers are reporting in finding attractive investment opportunities. “Despite this build-up of cash, investors and fund managers are keener than ever to put more money to work in the space. More than 1,800 funds were seeking to raise capital from investors at the end of the third quarter of 2016, Preqin reported, another record. This includes a Chinese venture capital fund seeking roughly $30 billion—if successful, it will be the biggest private equity fund ever raised. Meanwhile, 56% of institutional investors polled by Preqin said they intended to increase their allocation to private equity, with just 7% saying they would decrease it. However, Christopher Elvin, head of private equity products at Preqin, warned that the good times may not last much longer. Several high-profile investors have “downgraded the projected performance of their private equity commitments” due to high valuations, according to Previn’s report. In contrast to the long-term trends, in the third quarter of 2016 private equity managers raised an aggregate $62 billion—the lowest quarterly fundraising total since Q3 2013, Preqin said. More than a third of this total—$22.2 billion—was raised by the five largest fund closes. Become A Member Now. Great Rates And Safety Guaranteed. Member FDIC. You can learn a lot about market expectations and investors’ deepest fears by watching what they do as opposed to what they say. Many strategists and media people are operating under the assumption that “rising rates” are the biggest investor fear right now, but they have it absolutely backwards – that seems to be the last thing on our collective mind right now, judging by where we’re putting out money. Tobias Levkovich and Citi’s fund flows team looks at the year-to-date data and show a really stark change in investor appetites from 2015 into 2016. Some of the swings we’re seeing are absolutely bananas over the first 9 months of the year. Total equity funds posted cumulative outflows of $158.41 billion through September down from the outflows of $9.38 billion during the first nine months of 2015. US oriented funds experienced cumulative outflows of $149.76 billion during the first nine months of 2016, meaningfully worse than the cumulative outflows of $113.47 billion that were recorded over the same period in 2015. YTD through September 2016, combined equity mutual funds and ETFs recorded cumulative outflows of $72.94 billon vs inflows of $87.12 billion attracted over the first nine months of 2015 with both domestic and international flows suffering. Year-to-date, money market funds have seen outflows of $82.01 billion versus outflows of $62.26 billion in the first nine months of 2015…In [all of] 2015, money markets attracted inflows of $21.46 billion. For the full-year 2014, money market funds recorded cumulative inflows of $6.24 billion. In 2013, money market funds attracted inflows of $15.04 billion. In other words, money market funds are on pace to see their first year of outflows since investors took a net $180 million out in 2012. So if we’re not buying stock funds (and we clearly aren’t) and we’re not stashing it in cash, what are we doing? Well, I’ll tell you what we’re NOT doing – we’re certainly not panicking about rising rates, no matter how badly the media wants us to. According to ICI data collected and parsed by Citi’s Fund Flow Insights report, we’re going bananas for bond funds. Fascinatingly, combined bond fund inflows in the first nine months of 2016 year to date were more than 4x the inflows over the same time period in 2015. If we’re not afraid of rate hikes, but unwilling to bet on stocks or sit in cash, then it stands to reason we are more afraid of two other things: The election and fear of earning no returns. This leads to an enormous 4x swing in bond fund inflows and the tidal wave of money sloshing out of stocks and cash. In other words, watch what they do, not what they say. The interesting question is whether or not the election’s end, followed a few weeks later by the Fed meeting (and supposed rate hike) does something to change this dynamic. 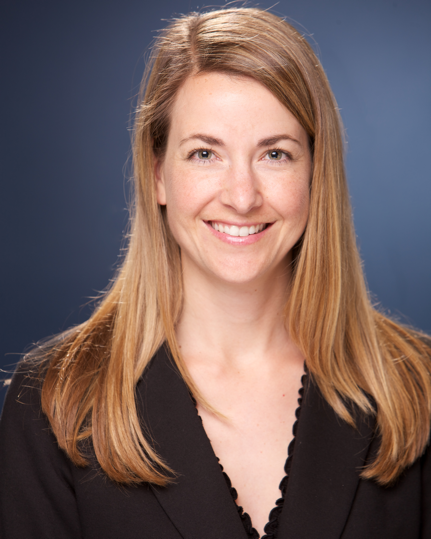 Kelly Graziadei is Director of Monetization Product Marketing at Facebook. Graziadei: I have spent a lot of time racing toward a finish line…a new job, a move, a promotion. But as soon as I arrive, the celebration is often very short and suddenly there’s a new race and a new finish line. The big learning for me has been that there is no finish line and there’s little glory in “winning” any individual race. What drives me today is managing my time to have the life I want — time to take care of myself so I have the energy for work and family; precious time with my family; time to work on the big, juicy problems at work, and time to coach and support my colleagues and help shape and support the next generation of leaders. This is a lifelong adventure and I don’t want to get to the finish line anytime soon.